See the Colorado native live at the Bluebird Theater on September 28! The team here at Our Community Now had a chance to chat with rising country star Spencer Crandall. At only 23 years old, Crandall is quickly making a name for himself. His 52 Eighty Acoustic Mixtape debuted at No. 1 on the iTunes Charts in March of 2018 and he has an Instagram following over 190k. Furthermore, his success on Spotify continues to grow with his current singles having streamed over 1.7 million times collectively. So, you are set to perform at the Bluebird Theater on Sept. 28, correct? Being a Colorado native, what is the best part about performing in the city where you grew up? CRANDALL: First of all, I just love Colorado. It’s great just being back and being around the mountains, that’s always a treat. But … it’s a fun opportunity to get everyone in the same place and see so many familiar places. And, obviously, to play for the Denver fans who have supported me from the beginning. For those of us who don’t know your story, can you tell us a little more about how you got into the music industry? CRANDALL: Really, I didn’t sing or do any music until only a couple years ago. I loved football and wanted to play football in high school and throughout college. So I went to play college football and had two shoulder surgeries, and was told pretty quickly that I couldn't play football anymore. So my entire identity as a person was kinda stripped away from me … so I was in college, and depressed in my dorm room, and didn’t know what else to do. I couldn’t lift weights, I couldn't play football anymore -- I just picked up a guitar and just started messing around. Decided to move to Nashville about two years ago and have loved every part of it. How would you describe the songs you sing and write? Is it modern country? Or how would you peg that? CRANDALL: I love country storytelling but I’ve always been attracted to hip-hop, Justin Timberlake, EDM -- I love music that can make you move and can make you dance. So, I pull from all places. It’s country storytelling, it’s for country people … but in a way that feels fresh to me and makes people dance. You just released your single “City Girl,” can you give us some background on that song? CRANDALL: Yes … it’s kinda me just writing about somebody who I felt like they tried to completely change from who they are, who is like a country girl -- talk and go hang out in the middle of nowhere -- to someone who is like in a club, trying to hang out with celebrities, and like, that’s not you. So just trying to be someone who you’re not and kinda calling that out a little bit, but in a fun, kinda tongue-in-cheek way. You also recently, well, somewhat recently, released your Acoustic Mixtape which has been doing really well -- so congrats on that! Do you have any new projects that you’re working on? CRANDALL: We are hoping to put out a bunch of new music in the fall and early spring next year. We’ve kinda taken the end of the summer to go hard in the studio and I’m actually in there today finishing up three new songs. I can’t give you all the details, but we have a ton of music coming and I’m so excited about it. Especially to play these songs live. And I am not with a major record label, I’m not with anything crazy, I’m not on the radio -- so when I put out music, it’s all fan driven. So, it’s so fun to give my fans music because they are the ones that support me. Well, we will be on the lookout for those new songs coming. All right, rapid fire time, you ready? CRANDALL: West Coast. I’ve never been to the East Coast. CRANDALL: Uhm, there is so many! I usually say Julianne Hough. Selena Gomez. Bud Light or Coors Light? CRANDALL: Coors Light. I’m from Denver. All right, single or taken? This one is for the ladies. CRANDALL: Single … and ready to mingle. CRANDALL: N*Sync! JT all the way. And finally, if you weren’t a country star, what else would you be? CRANDALL: I would do something in the entertainment industry. I just love entertaining people, making them laugh and smile. I was always the kid that wouldn’t shut up in class and kinda class clown. So I’d probably do something in comedy. One of my dreams growing up was to be on SNL, I love sketch comedy so I’d probably do something like that. Well, thank you for taking the time to chat with us. We’re super excited about your upcoming show, it's going to be pretty fun. CRANDALL: Of course, thank you so much. I’m so excited. I literally can’t wait. I’ve been waiting way too long for this show, so it’s gonna be so awesome. 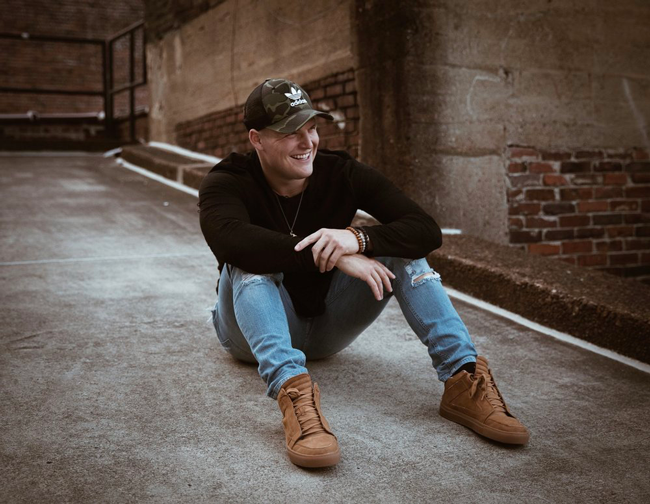 Don’t wait to get your tickets to see Spencer Crandall perform at Denver's Bluebird Theater on September 28! Doors open at 7 p.m., show starts at 8 p.m. Click here to purchase tickets. And we will be giving away TWO tickets on our Instagram and TWO on our Facebook -- so make sure you give us a follow for a chance to win! Winners will also have the opportunity to participate in a meet and greet with Spencer Crandall. Special thanks to Spencer Crandall. The Bindery: An Eatery, Market, and Bakery Comes to LoHi.